Always looking for the right thread color for your machine applique projects? Look no further! Julie has curated a lovely collection of colors that are used on most all of the projects featuring machine applique by Stitches of Love. 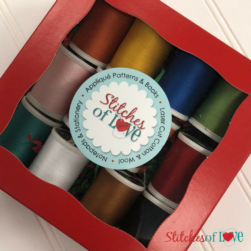 Each spool is 500 yards/450 meters of long-staple 30 wt cotton … the perfect weight to achieve a beautiful buttonhole stitch on all of your Stitches of Love machine applique projects! This thread kit is a must-have if you are a member of one of our machine applique clubs or block of the months! Purchase this product now and earn 96 Project Points! Sulky 30 wt thread gives a nice dimension to your buttonhole and straight accent stitches on machine applique projects. The Sulky Thread specifically is a long-staple cotton with a matte finish. It is strong and able to be machine washed, hand washed or dry cleaned. This versatile thread is available in a variety of colors. This curated collection by Julie features the 16 most commonly used colors on Stitches of Love machine applique projects.